In my quest to have more regular posts, recipes, stories, photo walkabouts, I'll start with dessert first this time! This soufflé is far easier than you realize. You can make the base ahead of time, get the ramekins prepped and then whisk the egg whites right before you're ready to make the soufflé. And you'll read it here first - I'm creating a new foodie trend - these soufflés are topped with "Gingersnap Dust", a finely crushed crumble of ginger snap cookies. 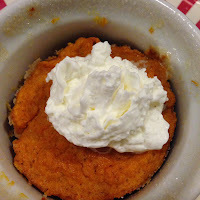 Since this soufflé is a lighter, far healthier version of a pumpkin pie, deconstructed, I wanted to add back in an element of a pumpkin pie that you might truly miss. Prepare the soufflé molds - Generously butter a soufflé mold or deep-dish casserole and dust the bottom and sides with sugar. Tap out the excess sugar. Cut a collar out of parchment to extend 3 inches above the rim of the dish. Tape the collar around the outside of the dish with masking tape; using a pastry brush, butter the inside of the paper collar. Chill the prepared mold. Alternatively, you can use 6 small, 4 ounce ramekins, buttering, sprinkling with sugar and if desired, creating a paper collar around each one. Chill and set aside. Separate the egg whites from the yolks, reserving one of the yolks. Save the other 2 egg yolks for another use. The yolks can be frozen. Put into a zip-lock bag, label quantity, date and freeze. In one mixing bowl, whisk together the pumpkin puree, sugar, pumpkin pie spice, flour, egg yolk, vanilla extract and milk. Whisk until thoroughly combined. Beat egg whites in a CLEAN large bowl until stiff peaks form. Fold 1/3 of egg whites into pumpkin blend. Continue to fold in egg whites 1/3 at a time until egg whites are completely folded into the pumpkin mixture. Don’t worry if there are some streaks of egg white remaining. Pour pumpkin/egg mix into the prepared ramekins, leaving 1-inch from the top to allow room for the soufflé to rise. 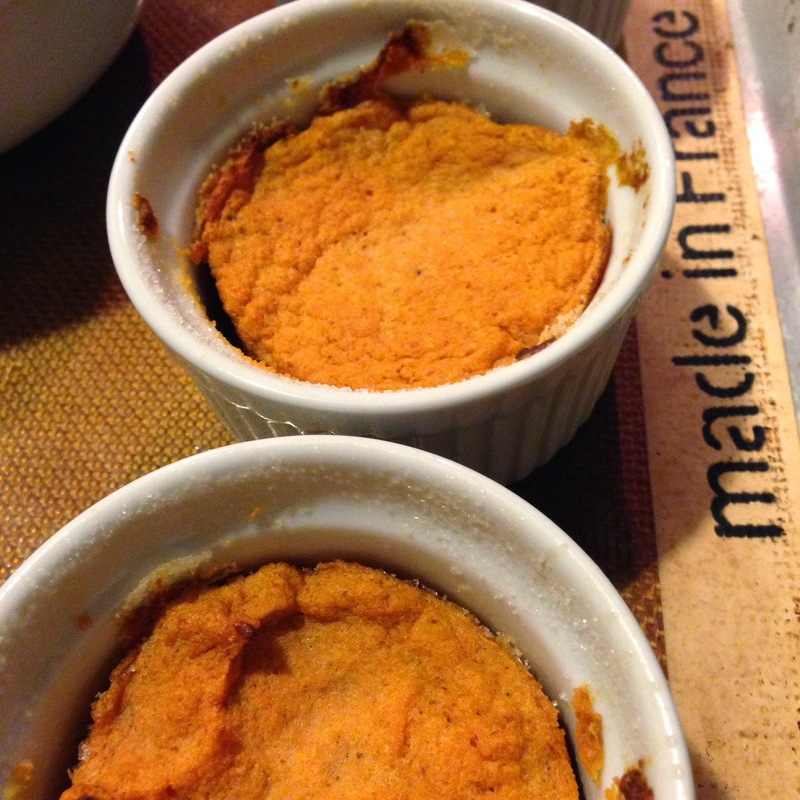 Place ramekins or soufflé mold on baking tray and put into oven. Bake a large, single soufflé for 40-50 minutes; small ramekins for 25-30 minutes. DO NOT OPEN OVEN TO CHECK ON SOUFFLÉS or else they will fall. If you must look at them, turn on the oven light. When the soufflés are done, they will be high but will most likely, deflate very quickly. Remove the parchment paper collars, and serve immediately. 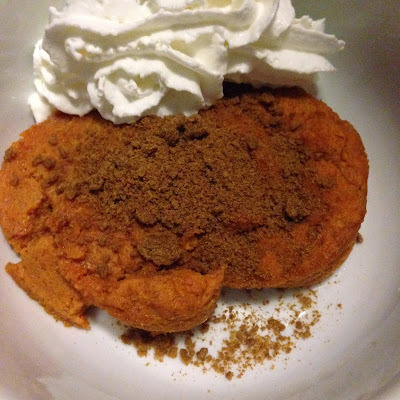 Garnish with a dusting of the ginger snap cookie crumbs and/or dust with powdered sugar or a dollop of whipped cream. Most of this recipe can be done ahead of time. Prepare the ramekins and chill them. Make the soufflé base - the pumpkin mixture. When the it’s time to make dessert, whisk the egg whites then continue following the recipe as directed. A soufflé is best finished/baked and served as close to dessert time as possible. This soufflé can be sweet or savory - used for dessert or as a side dish. Without using the flour as a stabilizer, it can also be a gluten free dish. To make this a savory side, omit the sugar and vanilla extract and add in tablespoon each of dried thyme, parsley and a 1/2 cup of finely grated cheese such as a gruyere, fontina, cheddar or even parmesan.